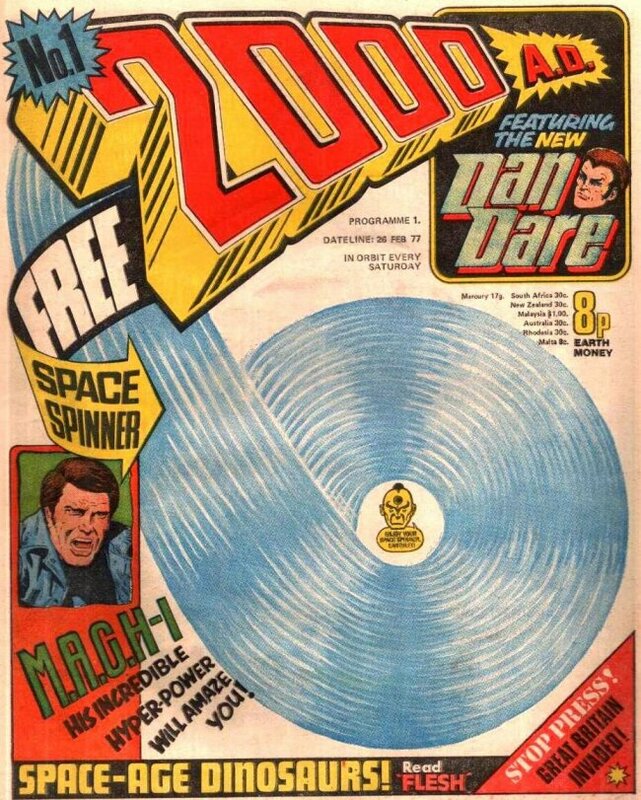 When I was idly going through eBay and saving 2000 AD lots to my Watch List for the auctions to expire, I found myself particularly attracted to the covers from the prog twenties. They were real pulpy affairs and I was fascinated as to what internal strips that they could relate to. It transpires that the answer is none. These were a series of “Superscan” covers. It seems that the artist drew whatever pulp science fiction theme they wanted, then an editor wrote a short story loosely based around the illustration of no more than two hundred words or so to run in the Nerve Centre (the editorial page). For me, this Brian Bolland cover isn’t the best of the “Superscan” series. This might be ironic given that he went on to become one of the best established comic cover artists of the last two decades. Prior to prog 350, where I began buying 2000 AD every week, there is only one issue that that I deliberately set out to buy. I must have owned around a hundred issues before 350, but 99% of these were only bought if I was bored, had the money and chanced upon it in a newsagent. 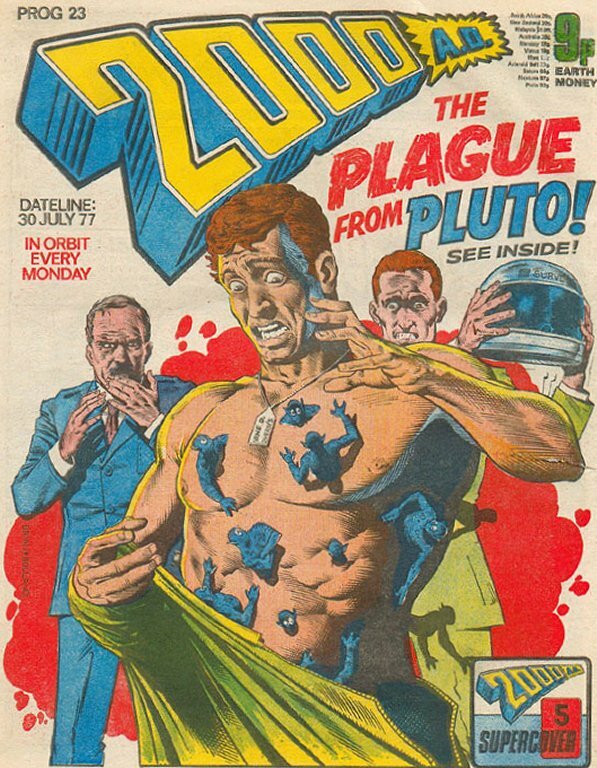 Anyway, that one issue was prog 1. How I heard about it originally, I’m not entirely sure. Some part of my memory tells me that I saw an advert on TV, either early one Friday evening or Saturday morning. 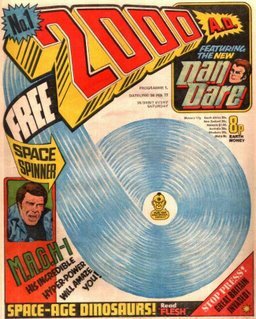 I also have a suspicion that John Craven’s Newsround did an item on the return of Dan Dare to comics. Whatever, I can’t imagine how I would have known about it even though I was buying lots of Marvel UK titles at the time. 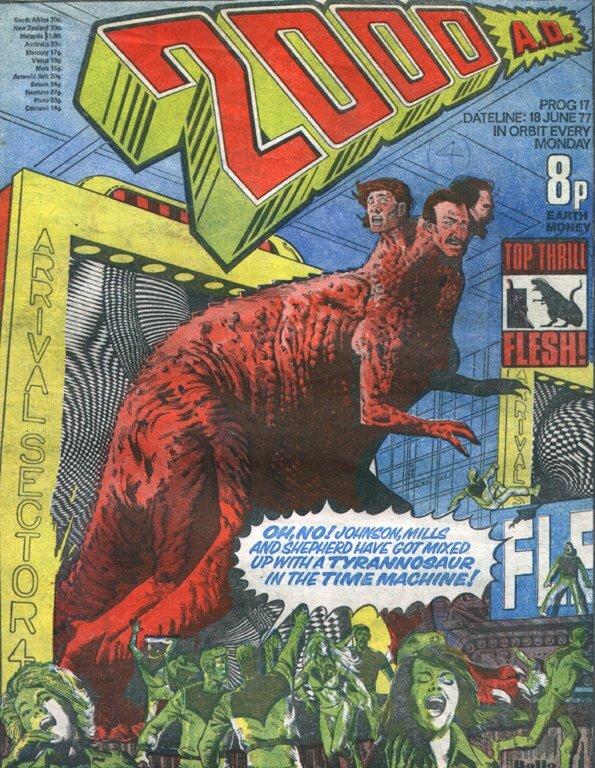 I think this is probably the third time that I’ve owned a copy of 2000 AD prog 1. Obviously, I bought it when it was first published. A couple of months later, I swapped the issues I was missing for the first issues of The Mighty World Of Marvel determined never to miss a programme from that point on. Thanks to some sort of mental spasm, I cut an inch off the end of the first twenty so that they were the same size as my collection of narrower Marvel UK comics I had. Then I realised that I lost some of the strips thanks to my handy work, threw the copies I had ruined away and didn’t buy an issue for over eighteen months. Ten years later, I bought the first six from my friend Michael Flack for five Earth pounds. They were in shocking condition but I later sold them along with the rest of my pre-prog 350s to a retailer believing that I had all the strips that I wanted from them in one reprint collection or other. Ten years ago, I got rid of the rest of my collection shortly after moving into my new flat and needing money to furnish it. (Obviously, I had to sell a lot of other stuff too). Over the last few months, during quiet periods in the office, I found myself placing 2000 AD collections into my eBay watch list. Fortunately, I had the discipline not to bid on any of them. That is until a couple of weeks ago when I won an auction for one thousand issues starting with prog 1 and only missing a handful. It’s like the saying goes; eBay will find lots for idle hands to bid on. Actually, I got a very good deal, but this didn’t stop me from feeling ill the night I had won the auction. Had I been impetuous bidding on the lot? Where would I store them all? When will I find the time to read them all? This prog features the last part of the opening Flesh run making it the first of the original strips to be removed from 2000 AD’s line up. I have no idea if this was down to a lack of popularity with its readers or for some other reason. Even though Tharg hadn’t started running voting forms at this stage, he still often asked readers to let him know what their favourite strips were in his editorials (all of which I also intend to re-read during this experiment) but I would still be surprised if this were the case. I remember reading this the first time around and feeling uncomfortable at the bias in favour of the dinosaurs, that were rampaging around their era eating everyone, over the humans, even the “hero” Reagan. Now as an adult, rapidly racing towards forty, I totally appreciate this narrative preference. Reading this many progs inside a week has made the strip seem relentlessly brutal. I can imagine a kid reading this weekly when it was originally published and becoming frustrated by Ol’ One Eye’s refusal to die. Even in the final episode, she collapses, appears to be dead, is picked at by some other meat-eating dinosaurs, then suddenly heaves herself up for one final feeding frenzy. Hopefully, I will have succeeded in posting a picture of my favourite Flesh cover from this run with this entry. A fighting mad tyrannosaur enters a time machine at the same time as three ranchers, and exits in the 23rd Centaury with three human heads instead of its own. Considering that this was meant as a comic for children, I love the fact that playing this for laughs was avoided as the three heads are drawn expressing absolute terror. In the strip, other rangers shoot the beast dead to put the men out of their misery. Given that 2000 AD’s predecessor, Action, received such negative press because of its violent content, I wonder if this influenced the strips end in the comic. On the back of Prog 18, which I read last night, there’s a page sized colour ad for T-shirts of the characters. It’s a surprise to me as I wasn’t aware that T-shirts were made before Titan came a long during the eighties with their French styled album collections of strips from the comic and spin off T-shirts. I was surprised to notice that the shirts were available to buy in both child and adult sizes. I always thought that the general opinion of comics at that time was that they were only being read by children and, if any adults were reading them, then they had learning difficulties and shouldn’t be exploited by the advertisers. All of the original strips had their own T-shirt dedicated to them. Dan Dare had two if you include The Mekon. Even Tharg (too right) got one. Therefore, you might be surprised to hear that the only exception to the range is Judge Dredd.